One active vent in the West crater produced tall, candle-like strombolian eruptions in intervals of 10-15 minutes, throwing incandescent material up to 200-250 m above the crater. 3 vents were active in the central crater, all of them glowing constantly, and relatively strongly spattering; small boiling lava lakes present few meters below the crater rim can be inferred. The northermost of these vents, forming a tall cone, also had strong strombolian eruptions at irregular intervals of 5-25 minutes, throwing lots of very hot, incandescent bombs to up to 100-150m elevation, frequently outside the crater complex. At least one vent was active in the NE crater, which unfortunately was today completely hidden by fumes. It did not erupt visible bombs, but every 10-20 minutes it produced loud hissing noises; we assume that it erupted mainly gas. The level of activity is surprisingly high, comparable to what it had been in late 2002, just before the effusive eruption that lasted into June 2003. It appears the activity has more or less been so since at least October 2005; in other words, the magma column inside the conduits must be very high. We think that a new effusive eruption (a lava flow emerging from the craters) might not be too far away. Who knows? Photos from our excursion are available at a new page. Weak spattering from a glowing vent in the central crater of Stromboli (15 Nov. 2005), photo by Sebastian Laiblin. 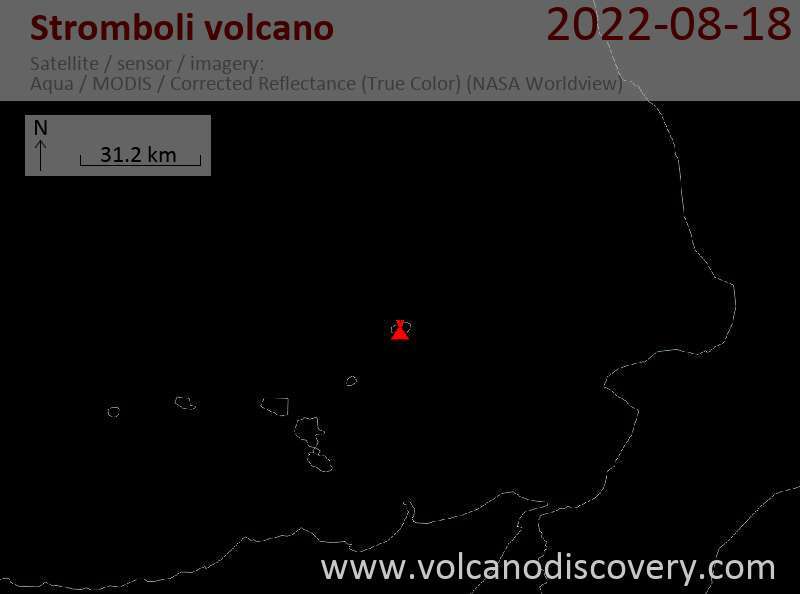 Activity is medium-low at Stromboli volcano. During a visit of a VolcanoDiscovery group on 12 November, 4 vents were observed active: two glowing vents on top of small spatter cones within the former central crater complex were weakly spattering, while a third vent was emitting impressive jets of gas with few glowing spatter, accompanied by extremely loud jet-engine like sounds. A single vent, also glowing, was active at the NE crater, erupting strombolian bursts every 10-30 minutes to up to about 100m height. On a repeated visit tonight, with extremely strong SW wind, the same craters were active, but producing only very small and rare explosions. Marco Fulle sends this report based on observations made by a VolcanoDiscovery group, who climbed Stromboli on 11 Oct. 2005: Stromboli's activity was significant, with 8 active vents in three clusters (corresponding to the former W, Central and E craters): during 1 hour, they observed 2 faint eruptions from the W vent nr. 1, which is hidden from Pizzo, while stong glow was visible from the second vent in the W crater. During the same time, 5 eruptions occurred from the westermost vent in the central vent complex (the former Central crater), emitting few bombs but lots of gas during its eruptions, and seven (!) eruptions ejecting lava to up to 250 m height were observed from the second central vent, which is now found at the top of a tall cone. The eastern vent complex conprises 4 active vents: Blue flames were visible from E vent nr.1, while two simulataneous eruptions occurred from a second and third vent in the E crater, ejecting lava to up to 150 m. One of these vents is glowing visibly, the other one is hidden from Pizzo. A 4th vent, at the far E end of the E crater, is also hidden from Pizzo and was showing continuous spattering. The crater terrace of Stromboli volcano seen from its W rim. The oval-shaped, active crater terrace consists now of 3 clusters of vents, which corrispond to the former NW (towards Ginostra), Central and NE craters (towards the village of Stromboli). During our visits, no activity other than weak steaming was observed from 3 small pits inside the NW crater. The central crater complex has two open glowing pits that were observed spattering weakly, throwing bombs to up to 10-20 m height. A third vent at the northen end of the central crater is a circular cone about 15m tall, with a small round opening, about 1-2 m large, that was glowing and exploded from time to time, about every minutes, throwing a candle-like jet of lava to about 150 m, accompanied by a loud detonation noise that caused impressive echoes in the summit area (these echoes sometimes went back and forth between the Vanori and the Pizzo headwalls up to 5 times). The NE crater complex, heavily changed by the collapse of 30 Dec. 2002 and subsequent events, consists of at least 2 vents, of which one (to the W) is another small cone that we observed explode irregularly, at intervals of several hours, and throwing jets of lava to 100-150m, while the more active vent(s?) to the E end of the crater, not visible from Pizzo and the crater rims), showed beautiful strombolian activity every 10-30 minutes, with almost noiseless, wide sprays of lava to 50-100 m that covered the outer flank of the NE crater with bombs. During our observation times, no explosion was strong enough to throw glowing material to the steep flank of the Sciara del Fuoco. On the 26th of March, the Civil Protection authorities have partially re-openend access to Stromboli's summit area, which had formally been off-limits since the eruption and landslide in late December 2002. Access is free until 400m elevation without an authorized guide, and above that it is permitted to visit the summit area if accompanied by an authorized mountain guide, but the stay in the summit area is limited to 1 hour total duration and only until 11pm.